Tell us a little about the history of your city’s drinking culture. What are the traditional drinks and venues? Traditionally, because of our warm-all-year-round climate, Bangkok is a beer-drinking city for the majority of the population. Many people also go for a bottle of whisky with mixers in pubs and bars while enjoying live bands. How are things changing? Are young people drinking differently to older people? Does gender play a role? It has changed a lot over this past five years. Instead of normally ordering a bottle of whisky with mixer, young people nowadays would either go for a glass or two of cocktails or wine. The people in their 20s/early 30s also tend to go for lighter, lower-abv drinks than those in their mid 30s/early 40s. Gender does play a role in this as we see more women drinkers, albeit not heavy drinkers, but I think it has also to do with young people’s lifestyle that they want to enjoy drinks but still be able to function the whole night and the next day. How advanced is cocktail culture in Bangkok – are you seeing an increasing appreciation? Definitely. When we opened Vesper back in 2014, I think we and Hyde & Seek were the only two serious cocktail bars in Bangkok, if not in Thailand. And now there are probably 60-70 cocktail bars in Bangkok, so it has definitely grown a lot. In the past, consumers did not know much about cocktails, even the basic classics such as Old Fashioned or Negroni. Nowadays, that’s really standard and they can definitely differentiate between the good and the bad. Who and what are the pioneer bartenders and bars in Bangkok? Cocktail culture started with Hyde & Seek back in 2010. It was the pioneer of the Bangkok scene with a focus on ingredients and precision. Vesper, my bar, followed in 2014 and we were the first to unapologetically go for spirit-forward cocktails. Nowadays, you have the folks at Asia Today, who incorporate exotic, local ingredients into their drinks, which is really interesting. Where does the city rank in terms of bar scenes in Asia? Is it leading the way or are other cities and scenes more influential? Our cocktail culture, though not as sophisticated or influential as in Singapore, I would say is one of the top and fastest-growing scenes in south east Asia. Of course, in Asia as a whole, we are still lagging behind Taipei, Hong Kong and Tokyo, but hopefully we will be near them soon. Guest bartenders from Europe, the US and Asia visit us all the time and our bartenders are getting more recognised internationally. Currently, we have six cocktail bars in Asia’s 50 Best Bars, including Mandarin Oriental’s Bamboo Bar, Backstage, Vesper, Teens of Thailand, Smalls and Ku Bar. Do economical or political shifts affect cocktail consumption in Bangkok? Yes, sure. There is more of a middle class in the city with higher purchasing power than before. Not only do they consume cocktails more, but because they have travelled to more sophisticated cities like London, Singapore and New York, they know proper drinks, which is good for the industry as a whole. What are the challenges the city’s bartenders/owners face? Bangkok is a pretty liberal city with a good number of tourists and expats from western countries, so I wouldn’t say there are religious or cultural barriers. I think the challenge we face instead is how our bartenders can push the boundary further and not get too comfortable. We also have to find what it is that makes us a unique destination for cocktail lovers. Who made you the best cocktail you’ve had in Bangkok? My go-to drink is a Vesper. Hence the name of my bar. 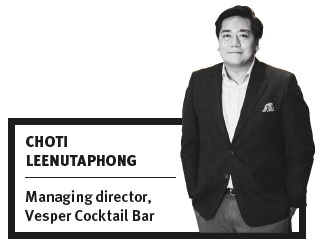 I don’t want to be biased but Supawit Muttarattana, our bar manager at Vesper, makes the best Vesper.